The popular vacation destination of Rocky Mountain National Park provides visitors with breathtaking views of the Rockies, high-altitude adventures, wilderness hikes and plenty of fishing, wildlife viewing and scenic drives. 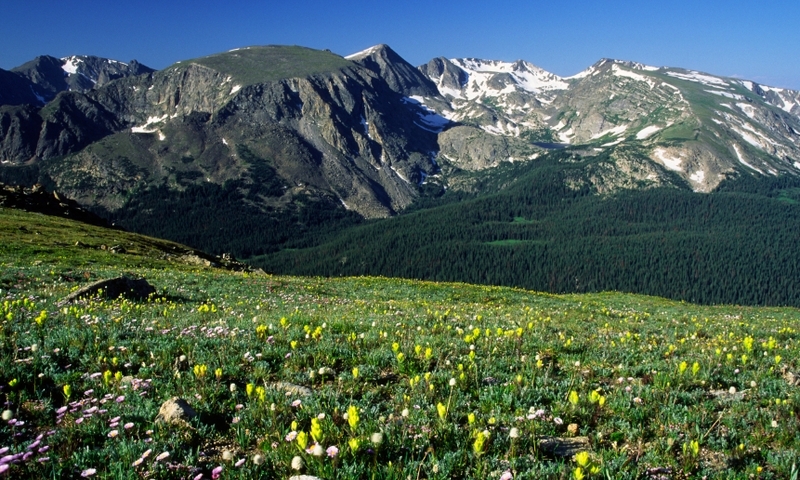 Rocky Mountain National Park, Colorado contains mountains that tower from 8,000 to more than 14,200 feet high. With countless hiking trails, sub-alpine and alpine lakes, wildflower-filled meadows and abundant wildlife, this park is a must-see for any traveler. It’s easy to get to Rocky Mountain Park. Interstate 70 intersects with Interstate 25 in Denver. Take I-25 north to exit 243 and go west on Colorado Highway 66 to Lyons, Colorado. Here you take US Highway 36 to Estes Park. Estes Park is the eastern gateway to Rocky Mountain National Park and from here either Highway 36 or 34 will take you directly into the park. Mailing address is 1000 Highway 36, Estes Park, CO 80517-8397. Phone for visitor information is 970-586-1206. Rocky Mountain NP is accessible all year, although some sections are closed at various times. You can always find posted information about any closures at visitor centers. It’s thrilling to spot the park’s wildlife in their natural environment. You’ll likely see cougars, bighorn sheep, black bears and coyotes. Look carefully in meadows for elk grazing, particularly around dawn and dusk. See moose in willow thickets by the Colorado River. You might even see some marmots in the alpine tundra areas along Trail Ridge Road. 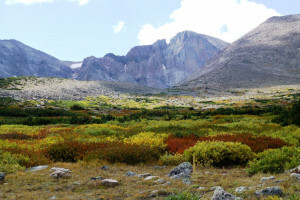 Rocky Mountain National Park has over 300 miles of trails, many great for families. Some of the best scenic trails are Coyote Valley Trail - 5 miles north of Kawuneeche Visitor Center, Sprague Lake Trail - a mile west of the Park & Ride on Bear Lake Road and Bear Lake Trail - at the end of Bear Lake Road. Numerous lakes and creeks in Rocky Mountain Park have healthy populations of trout. You’ll find brook, rainbow, cutthroat and brown trout. Go to Bear Lake, Bench Lake, Hunters Creek or the South Fork Poudre River. Other lakes that are known to have fish are Little Rock Lake, Lake Verna, Mills Lake and Loch Vale. There are many more. Be sure to look up the list of regulations on fishing in the park at any of the visitor centers and ranger stations. With five campgrounds in the park, you have a wide choice of where you want to sleep out under the stars. You will need reservations for Glacier Basin Campground, Aspenglen Campground and Moraine Park Campground. The other two are first-come, first-served. On the east side of Rocky Mountain National Park, you’ll find it is fairly dry and there’s only a patchy snow cover. It’s the ideal place to trek the trails on snowshoes. Ranger-led winter activities are the perfect way to start out if you haven’t tried this before. Inspect the area before beginning your winter play in Hidden Valley. There are great places for sledding here, but you should check with a visitor center for condition reports. The North Supply Access Trail has a wonderful two-mile stretch for snowmobiling. Enos Mills came to the area in 1884 and did much exploring. He began lobbying for legislation to create Rocky Mountain Nat Park. A bill finally passed Congress and thus the park was established on January 26, 1915 by the approving signature of President Woodrow Wilson. Another National Park gem in Utah - Zion. If you like the grand landscapes of Rocky Mountain National Park, you'll love Yosemite!